Recently, the Copyright Royalty Board announced their new rates that will be set in place in the coming new year, they apply to internet radio and digital webcasting. The new year brings lots of fresh chances for artists, look at Future Of Music’s top 10 things to know about the new change. “1. These rates apply only to sound recordings played on non-interactive webcasts. Nor will this decision impact how money flows from satellite radio revenue. Under the current law, satellite services are grandfathered in under a percent of revenue arrangement (this would change under the proposed Fair Play Fair Pay act, which is one reason we support it). Nor will it impact interactive services like Spotify, Youtube, Apple Music, etc. These services don’t pay sound recording royalties through a statutory license but instead rely on direct deals with rightsholders. 2. This is money that gets collected and distributed by SoundExchange. 5% – goes to a fund operated by musicians unions AFM and SAG/AFTRA for distribution to backing players, session musicians, and backing vocalists. Payment to artists through Soundexchange is direct, and can’t be held against recoupable debt to a record label. It’s a good, relatively transparent system and one artists can have confidence in. By the way, recording artists and independent labels, if you haven’t signed up for Soundexchange, you really should do so! You may have already earned royalties that you don’t know about. It’s free and easy! 3. This new rate structure holds for 5 years. 4. This is serious money we’re talking about. Those micropennies really can add up. In all, SoundExchange has distributed over $3 Billion in royalties to artists and labels. $204 million of that came just in the third quarter of 2015. And it’s not all going to superstars either. Playlists on digital radio formats tend to be more diverse and inclusive of independent voices than commercial FM in the US. That certainly doesn’t mean everyone who gets airplay on digital radio is making big money, but for some, it can be a significant piece of their overall revenue pie. 5. All commercial webcasters are being pulled under one umbrella. 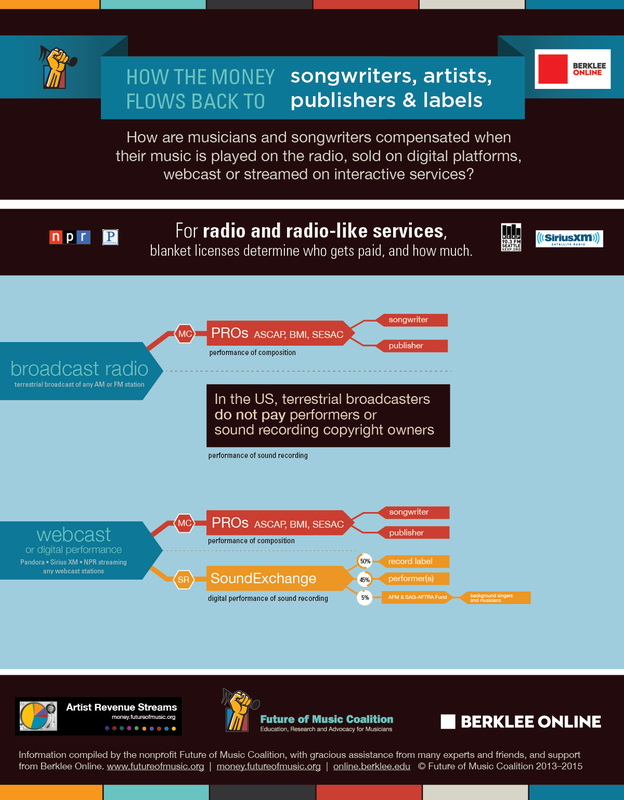 As a result of a piece of legislation called the Webcaster Settlement Act, through 2015, there were a whole bunch of different specialized licensing tiers for different types of services: commercial webcasters, microcasters, “pureplay” services, broadcasters simulcasting their FM streams, etc. The new rules make things quite a bit simpler starting in 2016. There’s one rate for nonsubscription streams ($0.0017) and one rate for subscription streams ($0.0022). 6. Pandora will pay artists/rightsholders more per play in 2016. That’s a good thing. Rates for Pandora’s nonsubscription service used to be calculated under the “pureplay” tier, which meant they paid $0.0014 per performance. As part of the CRB process, judges examined evidence and heard testimony from both Pandora and Soundexchange about what the future rate should be. Pandora argued for a lower rate of $0.0011 and Soundexchange made a case for a higher rate of $0.0025. While the new rate ($0.0017) didn’t climb as high as SoundExchange would have liked, it is a significant and deserved pay hike for artists. For subscription based non-interactive plays (about 15% of their overall business), Pandora had been paying $0.0025. That rate will now go down slightly to $.0023. But as the service has recently acquired interactive streaming service Rdio, its subscription offerings might be moving in a more interactive direction. 7. iHeart Radio will pay artists/rightsholders less per play in 2016. That’s a bad thing. Big commercial radio companies that also webcast got a serious price break in the new ruling, with rates lowered from $0.0025 to $0.0017. That’s the same rate they paid back in 2011, and now it’s locked in through 2020. What’s especially crazy about this: big radio isn’t required to pay performers a cent for playing their work over AM/FM radio, and they’re still fighting tooth and nail to avoid ever having to do so. In the face of this ongoing injustice, this cut in pay to artists is adding insult to injury. 8. Small commercial webcasters may face new challenges. The previous system offered small commercial webcasters multiple options for how to pay digital performance royalties for sound recordings. Services with annual gross revenue under $1.25 million could either pay the per-performance rate or pay a percentage of revenue/expense (10% of the first $250,000, 12% of anything after that, or 7% of expenses, whichever is higher.) The financial pinch of switching to a per-play payment regimen would be most acutely felt by small webcasters with low revenue/expenses but relatively high listenership. Not every small broadcaster saved with the “Small Webcaster” tier however. Those that were in the old “Microcaster” category would be unaffected; they’re still on the hook for a $500 minimum but probably nothing more. Those small webcasters that were already paying at a per-performance rate will find their fees actually go down. 9. Fewer reporting waivers = better data = good news for artists. In the past, very small commercial broadcasters (hobbyists with relatively low listeners or revenue termed “microcasters”) and many non-commercial webcasters had an option to pay an extra $100 a year to waive their obligation to submit reports of use telling SoundExchange precisely what they were playing. Their share of the royalties collected would instead be distributed using a system of sampling—a common practice among performance rights organizations. In such a system PRO tries to get a representative sample of everything that’s played and uses that as a proxy for unattributable income. The problem with sampling is that it’s easy for some of the smaller/niche acts to get missed. Under the new rules, the only webcasters who have the ability waive their reporting requirements are noncommercial stations affiliated with educational institutions. Aruging that data submission requirements were especially challenging to student-run stations that often rely on volunteer labor and novice broadcasters, College Broadcasters Inc, a nonprofit group representing college radio, negotiated this provision into their deal with SoundExchange, which was approved by theCRB. But other non-comm stations and very small commercial webcasters will have to submit more data than they have in the past. This move towards more complete and comprehensive data is good news for artists, if a potential minor annoyance to some broadcasters. Happily, though, technology in 2015 makes it much easier to generate reports in the correct format. Services like Spinitron make it easy for DJs or even automated systems to log what is being played and how many listeners are tuning in, while also providing audience development tools, like the ability to generate attractive shareable playlists. Broadcasters should feel good about submitting more complete data, because they’re helping make sure that every artist whose work they play is accurately accounted for, resulting in more artists getting paid accurately. 10. Remember, all the value comes from music. It’s been encouraging to see lots of growth in the webcasting sector over the last decade, at a time when some traditional revenue streams have dwindled. But we must keep in mind that none of the growth in this sector would be possible without the musicians and composers whose hard work is at the heart of it all. It’s only fair for them to see a bigger part of the rewards. Next articleWorldArts Featured Artist Evol Walks!